Super Bowl Sunday is right around the corner so we decided to use this opportunity to think about the sheer volume of media descending on New Orleans and take a look back at a couple of our favorite Super Bowl pregame show pieces DLP produced for FOX. Whether you’ve actually thought about it or not, the Super Bowl is the biggest, grandest, most watched single event in American sports. For the city of New Orleans it's a tremendous economic opportunity. DLP was actually down in the Big Easy just a couple of months ago doing a piece for the NBA and Fox Sports (link) and it's increadible to see the efforts the community has made to rebuild since Hurricane Katrina. 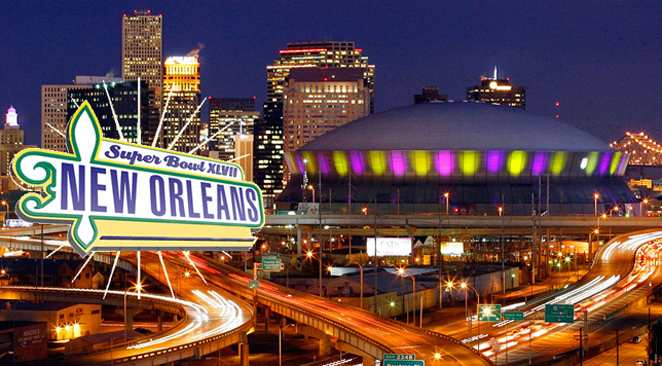 Although this is the 10th Super Bowl New Orleans has hosted (tied with Miami for the most), it’s the first since Hurricane Katrina, and only the second time they’ve hosted the Super Bowl while Carnival is going on at the same time. Carnival kicked off January 25 and is part of the Mardi Gras celebration that ends on Mardi Gras Day, which is February 12 this year. All you really need to understand is that two massive events are going on at the same time. More than a million visitors are expected, essentially doubling the metro area population. Among those visitors will be an estimated 5,000 members of the media covering an event that’s expected to be watched by 100 million people. Ultimately, the bottom line for New Orleans is an anticipated $1 billion windfall. A substantial amount of the expected cash influx has already been committed to infrastructure projects that’ll help the city put it’s best foot forward. From new streetcar lines and paved streets to a $356 million airport upgrade, New Orleans Mayor Mitch Landrieu has spent years preparing for this week. With an event like this, in a city of this size, finding a place to stay can be a real challenge if you’re not directly affiliated with the NFL. As part of the agreement with New Orleans, the NFL blocked off 90% of the city’s 30,000 hotel rooms. The remaining rooms were snatched up quickly, leaving a lot of tourists and even media to scramble for hotel rooms 80 or 90 miles down the road in cities like Baton Rouge, LA and Biloxi, MS. Despite the crowds and hotel shortages, for a great deal of tourists, restaurant owners, and members of the media, there’s nowhere else they’d rather be this week than New Orleans. While crowds flood into New Orleans this week DLP has crews filming some interesting pieces in Miami (The Miami Project - link) and New York. Look for more info about those shoots in upcoming blog posts. In the meantime, with the Super Bowl just a few days away it’s hard not to think back on a couple of recent DLP Super Bowl pregame show pieces that originally aired on Fox minutes before the big game. Back in February of 2008 when the Patriots were expected to cap off a perfect season this Russell Crowe narrated piece brought home an emmy. A couple of years ago Aaron Rodgers and the Green Bay Packers beat Big Ben and the Steelers 31-25 in Super Bowl XLV. Rodgers took home the Super Bowl MVP trophy, an award that ended up being a precursor to his 2011 MVP season. Before all of that happened Rodgers and some of his teammates got together with DLP in Dallas for a high speed Phantom shoot.